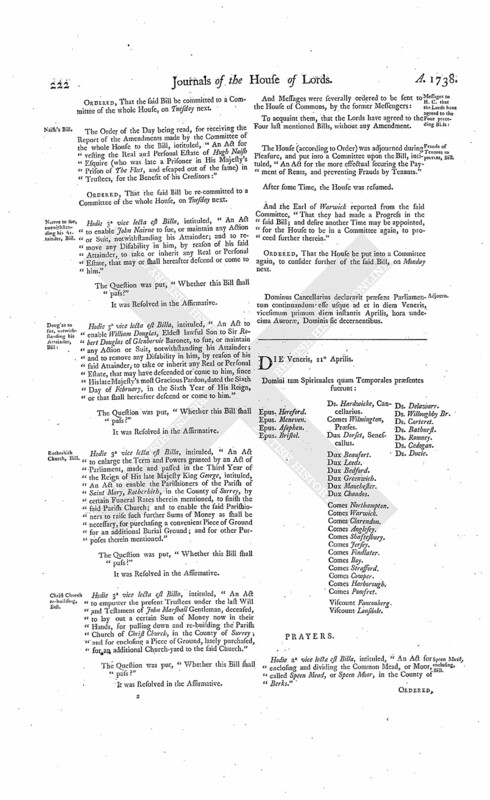 With a Bill, intituled, "An Act for enclosing and dividing the Common Fields, Wastes, and Unenclosed Grounds, within the Manor, Township, or Hamlet, of Ashenden, in the County of Bucks; and for the making effectual certain Exchanges therein mentioned;" to which they desire the Concurrence of this House. Naish's Estate to his Creditors, Bill. With a Bill, intituled, "An Act for vesting the Real and Personal Estate of Hugh Naish Esquire (who was late a Prisoner in His Majesty's Prison of The Fleet, and escaped out of the same) in Trustees, for the Benefit of his Creditors;" to which they desire the Concurrence of this House. With a Bill, intituled, "An Act for continuing the Terms and Powers granted and given by the Acts passed in the Twelfth and Thirteenth Year of the Reign of His late Majesty King William, and the Tenth Year of Her late Majesty Queen Anne, for recovering, securing, and keeping in Repair, the Harbour of Minehead, in the County of Somerset;" to which they desire the Concurrence of this House. Petitions of Respondents to Sir H. Dalrymple's Appeal, and Counsel to be heard. A Petition of Sir Alexander Hamilton Hope Baronet, Respondent to the Appeal of Sir Hew Dalrymple Baronet, was presented, and read; praying, "That the said Appeal may be set down to be heard on the First vacant Day for Causes; or that the same may be dismissed, as being irregularly preferred; without Prejudice to the said Sir Hew Dalrymple's bringing a new Appeal, in a proper Manner, as he shall be advised." 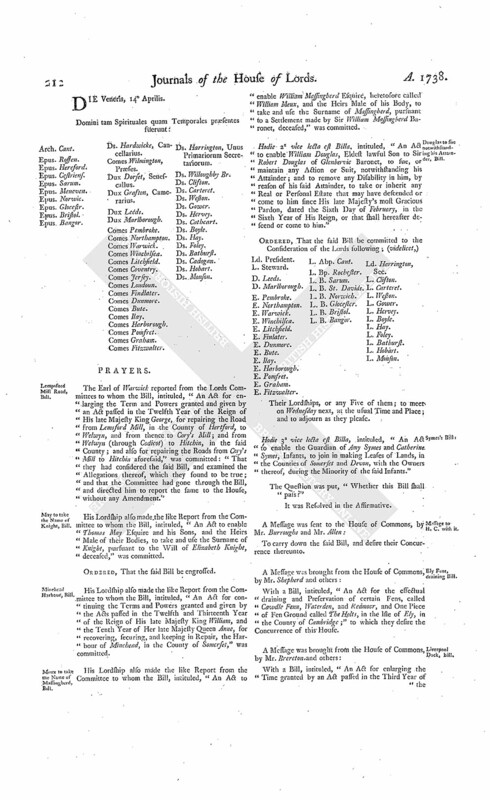 Also, a Petition of Mary Buchan Spinster, Respondent to the said Appeal of Sir Hew Dalrymple, was likewise presented, and read; praying, "That the Hearing the same may stand over till the next Session of Parliament, to the End the Matter of a Reclaiming Petition, preferred by the Petitioner to the Lords of Session in Scotland, against an Interlocutor by them made the 18th of January last, insisting thereby, among other Things, upon fresh Matter material for her Interest in the Cause, may, in the mean Time, be determined by the said Lords of Session, so that the whole Merits of the Cause may be brought in Judgement before this House at one and the same Time; or, if their Lordships should not be pleased to adjourn the said Appeal as aforesaid, that then the Petitioner may be at Liberty to exhibit her Appeal to this House, to be relieved against the said Interlocutor; and that both Causes may be heard at the same Time; and that the Petitioner may have such other Relief as to the great Wisdom of this House shall seem meet." It is Ordered, That this House will, on this Day Sevennight, hear One Counsel for each of the Parties at the Bar, upon the Matter of the said Petitions. The Earl of Warwick reported from the Lords Committees to whom the Bill, intituled, "An Act for confirming the Sale of the Leasehold Estate late of Barnaby Cole Gentleman, deceased; and for vesting his Freehold Estates in Trustees, to be sold, for Payment of his Debts," was committed: "That they had considered the said Bill, and examined the Allegations thereof, which they found to be true; that the Parties concerned had given their Consents; and that the Committee had gone through the Bill, and made some Amendments thereunto." The Lord Clifton (pursuant to the Order of this House Yesterday) presented to their Lordships a Bill, intituled, An Act for naturalizing Herman Bernard and John Bosquain." May to take the Name of Knight, Bill. Hodie 2a vice lecta est Billa, intituled, "An Act to enable Thomas May Esquire and his Sons, and the Heirs Male of their Bodies, to take and use the Surname of Knight, pursuant to the Will of Elizabeth Knight, deceased." V. Fauconberg. L. Abp. Cant. L. B. Bangor. Ld. North. 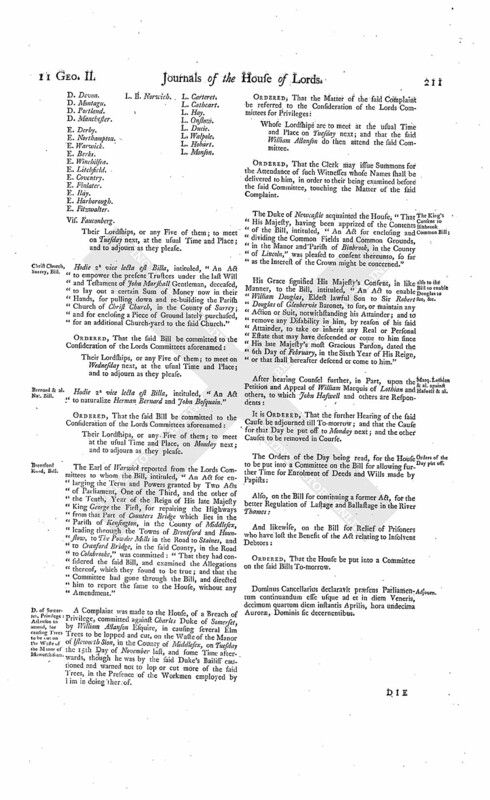 The Order of the Day being read, for the House to be put into a Committee upon the Bill, intituled, "An Act for the more effectual securing the Payment of Rents, and preventing Frauds by Tenants:"
Ordered, That the House be put into a Committee thereupon, on Thursday Sevennight; and that the Judges do then again attend. Hodie 3a vice lecta est Billa, intituled, "An Act for reducing the Stint of Beast Pastures and Sheep Commons, within the Manor, Town, and Parish, of Castle Donnington, in the County of Leicester." The House being moved, "That a Day may be appointed, for hearing the Cause wherein the Magistrates of Montrose are Appellants, and David Erskine is Respondent:"
Bill for Exemplification of Wills, &c.
Notice was taken to the House, "That, notwithstanding their Lordships did, on the 21st Day of February last, by their Order, direct the Judges to prepare, and bring in, a Bill for Exemplification of Wills and of Deeds enroled, and for making such Exemplisications and Copies of such Deeds Evidence in all Courts in England and Ireland; yet no such Bill was brought into the House." And it being moved, "That the same might be forthwith done:"
Mr. Justice Comyns, being present, acquainted the House, "That Consideration had been had of the said Order; and a Draught of a Bill was prepared; but, being a Matter of great Consequence, the Judges in Town thought it necessary to stay for the coming of the other Judges to Town, who were gone the Circuit." Bill concerning Administration of Assets of Insolvent Persons. Likewise, Notice was taken to the House, "That no Bill was brought in, pursuant to their Lordships Order made last Session of Parliament, relating to the Administration of Assets of Persons dying insolvent." And thereupon Mr. Justice Comyns again informed the House, "That Consideration had been likewise had of that Matter; and that a Draught of such a Bill had been made, and believed would be perfected, to be laid before the House, with all convenient Speed." Dominus Cancellarius declaravit præsens Parliamentum continuandum esse usque ad et in diem Mercurii, duodecimum diem instantis Aprilis, hora undecima Auroræ, Dominis sic decernentibus. Hodie 2a vice lecta est Billa, intituled, "An Act for vesting the Real and Personal Estate of Hugh Naish Esquire (who was late a Prisoner in His Majesty's Prison of The Fleet, and escaped out of the same) in Trustees, for the Benefit of his Creditors." Inverness Duty on Beer, Bill. With a Bill, intituled, "An Act for continuing the Duty of Two Pennies Scots, or One Sixth Part of a Penny Sterling, on each Pint of Ale and Beer that shall be vended or sold within the Town of Inverness, and Privileges thereof, for paying the Debts of the said Town, and other Purposes therein mentioned;" to which they desire the Concurrence of this House. Douglas to sue, notwithstanding his Attainder, Bill. With a Bill, intituled, "An Act to enable William Douglas, Eldest lawful Son to Sir Robert Douglas of Glenbervie Baronet, to sue, or maintain any Action or Suit, notwithstanding his Attainder; and to remove any Disability in him, by reason of his said Attainder; to take or inherit any Real or Personal Estate that may have descended or come to him since His late Majesty's most Gracious Pardon, dated the Sixth Day of February, in the Sixth Year of His Reign, or that shall hereafter descend or come to him;" to which they desire the Concurrence of this House. Christ Church, Surrey, rebuilding, Bill. With a Bill, intituled, "An Act to empower the present Trustees under the last Will and Testament of John Marshall Gentleman, deceased, to lay out a certain Sum of Money now in their Hands, for pulling down and re-building the Parish Church of Christ-Church, in the County of Surrey; and for enclosing a Piece of Ground lately purchased for an additional Church-yard to the said Church;" to which they desire the Concurrence of this House. The said Three Bills were all read the First Time. Hodie 3a vice lecta est Billa, intituled, "An Act for confirming the Sale of the Leasehold Estate late of Barnaby Coles Gentleman, deceased; and for vesting his Freehold Estates in Trustees, to be sold, for Payment of his Debts." Hodie 2a vice lecta est Billa, intituled, "An Act for enclosing and dividing the Common Fields, Wastes, and Unenclosed Grounds, within the Manor, Township, or Hamlet, of Ashenden, in the County of Bucks; and for the making effectual certain Exchanges therein mentioned." L. B. Bangor. L. Clifton. Their Lordships or any Five of them; to meet at the usual Time and Place, on Thursday the 28th Instant; and to adjourn as they please. Hodie 2a vice lecta est Billa, intituled, "An Act for continuing the Terms and Powers granted and given by the Acts passed in the Twelfth and Thirteenth Year of the Reign of His late Majesty King William, and the Tenth Year of Her late Majesty Queen Anne, for recovering, securing, and keeping in Repair, the Harbour of Minehead, in the County of Somerset." Complaint being made to the House, and Oath made at the Bar, "That Jasper Prince had brought a Declaration of Ejectment against William Tomkins, a Tenant of a Farm in the County of Oxon, belonging to the Duke of Argyll and Greenwich, within the Time of Privilege of Parliament, in Breach of the Privilege of this House; and that Joseph Cox had warned the said Tomkins out of the said Farm:"
Prince and Cox to be attached, for bringing a Declaration of Ejectment against One of his Tenants. It is Ordered, That the Serjeant at Arms attending this House, his Deputy or Deputies, do forthwith attach the Bodies of the said Jasper Prince and Joseph Cox, and bring them to the Bar of this House, to answer the Matter of the said Complaint; and this shall be a sufficient Warrant on that Behalf. M. Lothian et al. against Haswell et al. Dominus Cancellarius declaravit præsens Parliamentum continuandum esse usque ad et in diem Jovis, decimum tertium diem instantis Aprilis, hora undecima Auroræ, Dominis sic decernentibus. The Earl of Finlater reported from the Lords Committees to whom the Bill, intituled, "An Act to enable the Guardian of Amy Symes and Catherine Symes, Infants, to join in making Leases of Lands, in the Counties of Somerset and Devon, with the Owners thereof, during the Minority of the said Infants," was committed: "That they had considered the said Bill, and examined the Allegations thereof, which they found to be true; that the Parties concerned had given their Consents; and that the Committee had gone through the Bill, and directed him to report the same to the House, without any Amendment." Hodie 2a vice lecta est Billa, intituled, "An Act for continuing the Duty of Two Pennies Scots, or One Sixth Part of a Penny Sterling, on each Pint of Ale and Beer that shall be vended or sold, within the Town of Inverness and Privileges thereof, for paying the Debts of the said Town, and other Purposes therein mentioned." Vis. Fauconberg. L. Bp. Hereford. L. B. Norwich. Ld. Willoughby Br. Hodie 2a vice lecta est Billa, intituled, "An Act to empower the present Trustees under the last Will and Testament of John Marshall Gentleman, deceased, to lay out a certain Sum of Money now in their Hands, for pulling down and re-building the Parish Church of Christ Church, in the County of Surrey; and for enclosing a Piece of Ground lately purchased, for an additional Church-yard to the said Church." Bernard & al. Nat. Bill. Hodie 2a vice lecta est Billa, intituled, "An Act to naturalize Herman Bernard and John Bosquain." 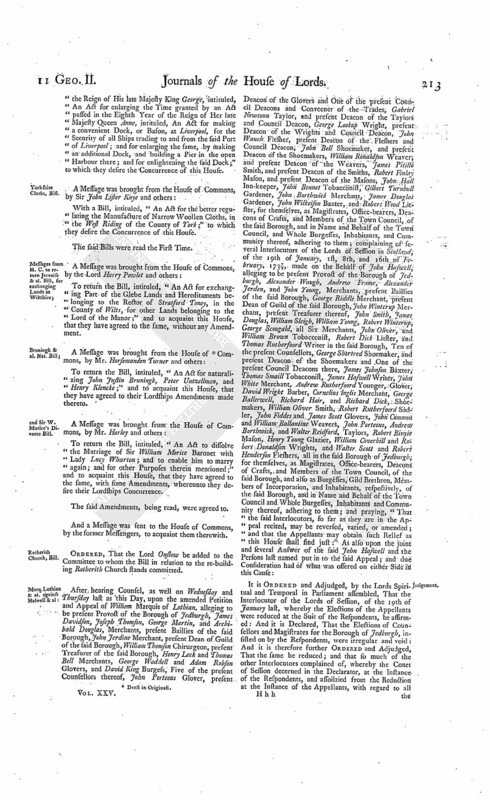 The Earl of Warwick reported from the Lords Committees to whom the Bill, intituled, "An Act for enlarging the Term and Powers granted by Two Acts of Parliament, One of the Third, and the other of the Tenth, Year of the Reign of His late Majesty King George the First, for repairing the Highways from that Part of Counters Bridge which lies in the Parish of Kensington, in the County of Middlesex, leading through the Towns of Brentford and Hounslow, to The Powder Mills in the Road to Staines, and to Cranford Bridge, in the said County, in the Road to Colnbrooke," was committed: "That they had considered the said Bill, and examined the Allegations thereof, which they found to be true; and that the Committee had gone through the Bill, and directed him to report the same to the House, without any Amendment." D. of Somerset, Privilege: Allanson to attend, for causing Trees to be cut on the Waste of the Manor of Isleworth Sion. A Complaint was made to the House, of a Breach of Privilege, committed against Charles Duke of Somerset, by William Allanson Esquire, in causing several Elm Trees to be lopped and cut, on the Waste of the Manor of Isleworth Sion, in the County of Middlesex, on Tuesday the 15th Day of November last, and some Time afterwards, though he was by the said Duke's Bailiff cautioned and warned not to lop or cut more of the said Trees, in the Presence of the Workmen employed by him in doing thereof. Whose Lordships are to meet at the usual Time and Place on Tuesday next; and that the said William Allanson do then attend the said Committee. Ordered, That the Clerk may issue Summons for the Attendance of such Witnesses whose Names shall be delivered to him, in order to their being examined before the said Committee, touching the Matter of the said Complaint. The Duke of Newcastle acquainted the House, "That His Majesty, having been apprized of the Contents of the Bill, intituled, "An Act for enclosing and dividing the Common Fields and Common Grounds, in the Manor and Parish of Binbrook, in the County of Lincoln," was pleased to consent thereunto, so far as the Interest of the Crown might be concerned." also to the Bill to enable Douglas to sue, &c.
His Grace signified His Majesty's Consent, in like Manner, to the Bill, intituled, "An Act to enable William Douglas, Eldest lawful Son to Sir Robert Douglas of Glenbervie Baronet, to sue, or maintain any Action or Suit, notwithstanding his Attainder; and to remove any Disability in him, by reason of his said Attainder, to take or inherit any Real or Personal Estate that may have descended or come to him since His late Majesty's most Gracious Pardon, dated the 6th Day of February, in the Sixth Year of His Reign, or that shall hereafter descend or come to him." Marq. Lothian & al. against Haswell & al. It is Ordered, That the further Hearing of the said Cause be adjourned till To-morrow; and that the Cause for that Day be put off to Monday next; and the other Causes to be removed in Course. Orders of the Day put off. Ordered, That the House be put into a Committee on the said Bills To-morrow. Dominus Cancellarius declaravit præsens Parliamentum continuandum esse usque ad et in diem Veneris, decimum quartum diem instantis Aprilis, hora undecima Auroræ, Dominis sic decernentibus. Comes Fitzwalter. Ds. Harrington, Unus Primariorum Secretariorum. The Earl of Warwick reported from the Lords Committees to whom the Bill, intituled, "An Act for enlarging the Term and Powers granted and given by an Act passed in the Twelfth Year of the Reign of His late Majesty King George, for repairing the Road from Lemsford Mill, in the County of Hertford, to Welwyn, and from thence to Cory's Mill; and from Welwyn (through Codicot) to Hitchin, in the said County; and also for repairing the Roads from Cory's Mill to Hitchin aforesaid," was committed: "That they had considered the said Bill, and examined the Allegations thereof, which they found to be true; and that the Committee had gone through the Bill, and directed him to report the same to the House, without any Amendment." His Lordship also made the like Report from the Committee to whom the Bill, intituled, "An Act to enable Thomas May Esquire and his Sons, and the Heirs Male of their Bodies, to take and use the Surname of Knight, pursuant to the Will of Elizabeth Knight, deceased," was committed. His Lordship also made the like Report from the Committee to whom the Bill, intituled, "An Act for continuing the Terms and Powers granted and given by the Acts passed in the Twelfth and Thirteenth Year of the Reign of His late Majesty King William, and the Tenth Year of Her late Majesty Queen Anne, for recovering, securing, and keeping in Repair, the Harbour of Minchead, in the County of Somerset," was committed. Meux to take the Name of Massingherd, Bill. His Lordship also made the like Report from the Committee to whom the Bill, intituled, "An Act to enable William Massingberd Esquire, heretofore called William Meux, and the Heirs Male of his Body, to take and use the Surname of Massingherd, pursuant to a Settlement made by Sir William Massingberd Baronet, deceased," was committed. Douglas to sue notwithstanding his Attainder, Bill. Hodie 2a vice lecta est Billa, intituled, "An Act to enable William Douglas, Eldest lawful Son to Sir Robert Douglas of Glenbervic Baronet, to sue, or maintain any Action or Suit, notwithstanding his Attainder; and to remove any Disability in him, by reason of his said Attainder, to take or inherit any Real or Personal Estate that may have descended or come to him since His late Majesty's most Gracious Pardon, dated the Sixth Day of February, in the Sixth Year of His Reign, or that shall hereafter descend or come to him." E. Fitzwalter. L. Abp. Cant. L. B. Bangor. Ld. Harrington, Sec. Hodie 3a vice lecta est Billa, intituled, "An Act to enable the Guardian of Any Symes and Catherine Symes, Infants, to join in making Leases of Lands, in the Counties of Somerset and Devon, with the Owners thereof, during the Minority of the said Instants." With a Bill, intituled, "An Act for the effectual draining and Preservation of certain Fens, called Cawdle Fenn, Waterden, and Redmoor, and One Piece of Fen Ground called The Holts, in the Isle of Ely, in the County of Cambridge;" to which they desire the Concurrence of this House. With a Bill, intituled, "An Act for enlarging the Time granted by an Act passed in the Third Year of the Reign of His late Majesty King George, intituled, An Act for enlarging the Time granted by an Act passed in the Eighth Year of the Reign of Her late Majesty Queen Anne, intituled, An Act for making a convenient Dock, or Bason, at Liverpool, for the Security of all Ships trading to and from the said Port of Liverpool; and for enlarging the same, by making an additional Dock, and building a Pier in the open Harbour there; and for enlightening the said Dock;" to which they desire the Concurrence of this House. With a Bill, intituled, "An Act for the better regulating the Manufacture of Narrow Woollen Cloths, in the West Riding of the County of York;" to which they desire the Concurrence of this House. The said Bills were read the First Time. 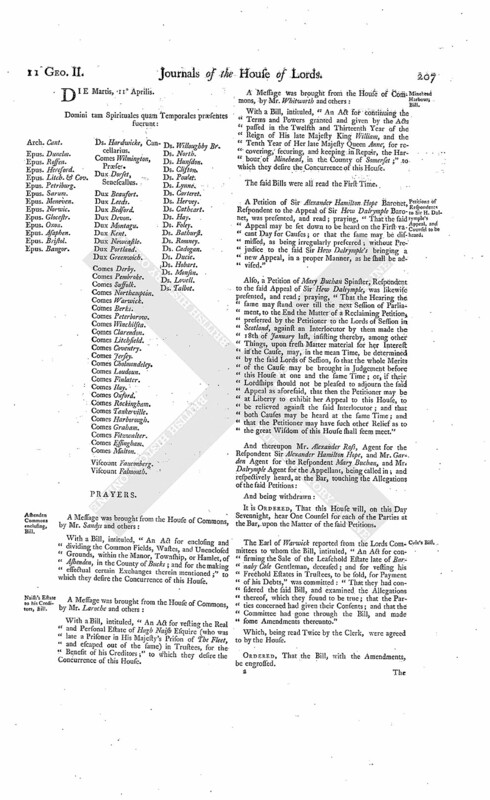 To return the Bill, intituled, "An Act for exchanging Part of the Glebe Lands and Hereditaments belonging to the Rector of Stratford Toney, in the County of Wilts, for other Lands belonging to the Lord of the Manor;" and to acquaint this House, that they have agreed to the same, without any Amendment. To return the Bill, intituled, "An Act for naturalizing John Justin Bruningk, Peter Untzellman, and Henry Klencke;" and to acquaint this House, that they have agreed to their Lordships Amendments made thereto. and Sir W. Morice's Divorce Bill. 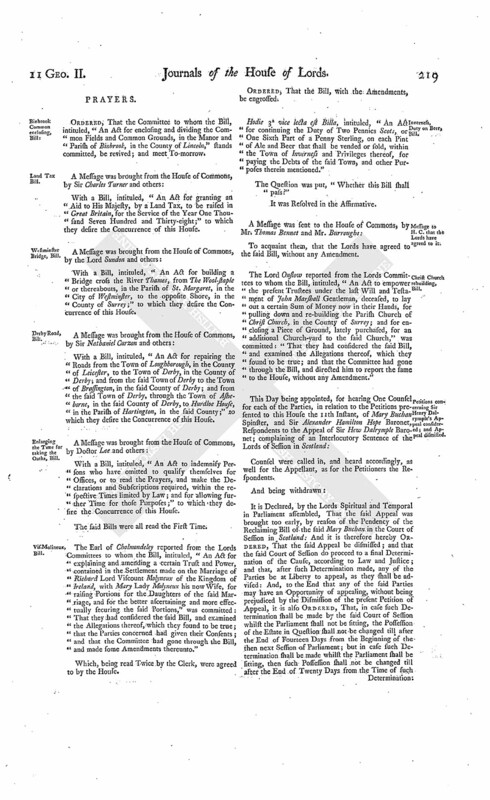 To return the Bill, intituled, "An Act to dissolve the Marriage of Sir William Morice Baronet with Lady Lucy Wharton; and to enable him to marry again; and for other Purposes therein mentioned;" and to acquaint this House, that they have agreed to the same, with some Amendments, whereunto they desire their Lordships Concurrence. Ordered, That the Lord Onslow be added to the Committee to whom the Bill in relation to the re-building Rotherith Church stands committed. 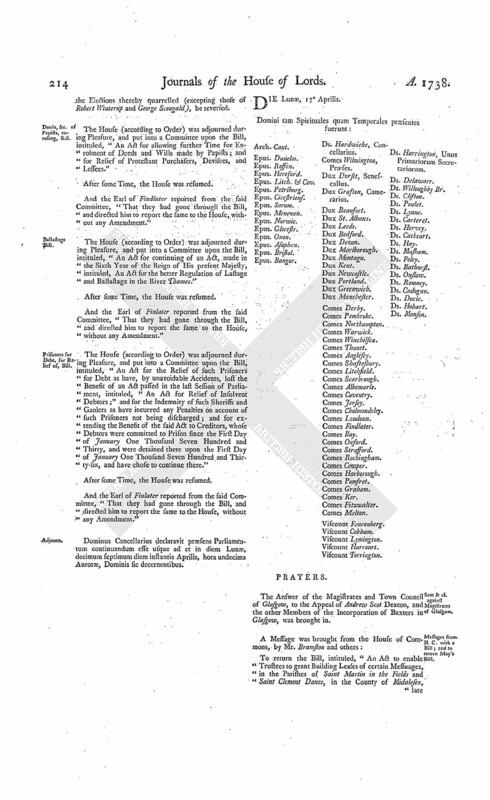 It is Ordered and Adjudged, by the Lords Spiritual and Temporal in Parliament assembled, That the Interlocutor of the Lords of Session, of the 19th of January last, whereby the Elections of the Appellants were reduced at the Suit of the Respondents, be affirmed: And it is Declared, That the Elections of Counsellors and Magistrates for the Borough of Jedburgh, insisted on by the Respondents, were irregular and void: And it is therefore further Ordered and Adjudged, That the same be reduced; and that so much of the other Interlocutors complained of, whereby the Court of Session decerned in the Declarator, at the Instance of the Respondents, and assoilzied from the Reduction at the Instance of the Appellants, with regard to all the Elections thereby quarrelled (excepting those of Robert Winterup and George Scougald), be reversed. Deeds, &c. of Papists, enroling, Bill. The House (according to Order) was adjourned during Pleasure, and put into a Committee upon the Bill, intituled, "An Act for allowing further Time for Enrolment of Deeds and Wills made by Papists; and for Relief of Protestant Purchasers, Devisees, and Lessees." And the Earl of Findlater reported from the said Committee, "That they had gone through the Bill, and directed him to report the same to the House, without any Amendment." The House (according to Order) was adjourned during Pleasure, and put into a Committee upon the Bill, intituled, "An Act for continuing of an Act, made in the Sixth Year of the Reign of His present Majesty, intituled, An Act for the better Regulation of Lastage and Ballastage in the River Thames." 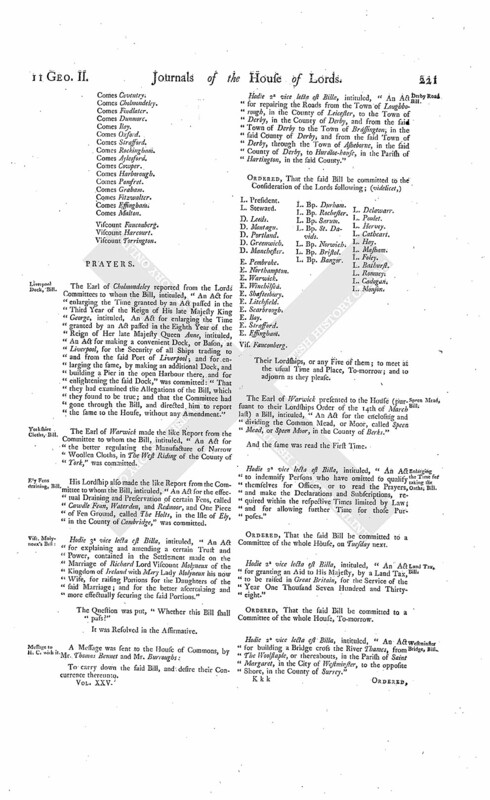 The House (according to Order) was adjourned during Pleasure, and put into a Committee upon the Bill, intituled, "An Act for the Relief of such Prisoners for Debt as have, by unavoidable Accidents, lost the Benefit of an Act passed in the last Session of Parliament, intituled, "An Act for Relief of Insolvent Debtors;" and for the Indemnity of such Sheriffs and Gaolers as have incurred any Penalties on account of such Prisoners not being discharged; and for extending the Benefit of the said Act to Creditors, whose Debtors were committed to Prison since the First Day of January One Thousand Seven Hundred and Thirty, and were detained there upon the First Day of January One Thousand Seven Hundred and Thirty-six, and have chose to continue there." And the Earl of Finlater reported from the said Committee, "That they had gone through the Bill, and directed him to report the same to the House, without any Amendment." Dominus Cancellarius declaravit præsens Parliamentum continuandum esse usque ad et in diem Lunæ, decimum septimum diem instantis Aprilis, hora undecima Auroræ, Dominis sic decernentibus. Scot & al. against Magistrates of Glasgow. 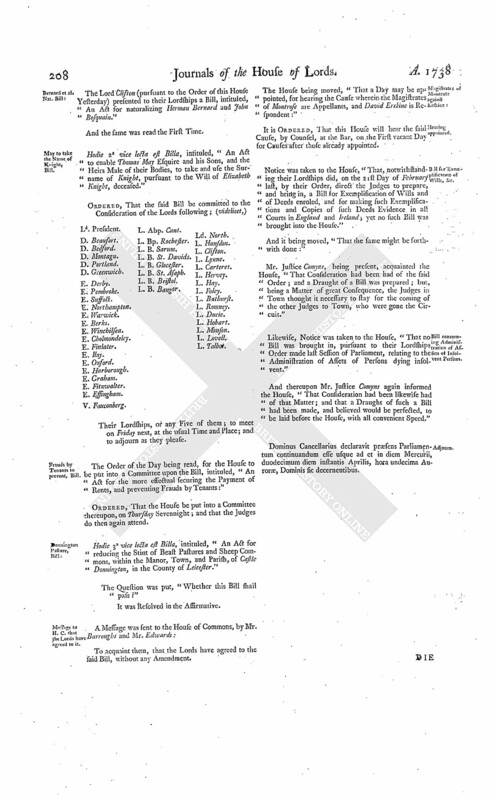 The Answer of the Magistrates and Town Council of Glasgow, to the Appeal of Andrew Scot Deacon, and the other Members of the Incorporation of Baxters in Glasgow, was brought in. Messages from H. C. with a Bill; and to return May's Bill. To return the Bill, intituled, "An Act to enable Trustees to grant Building Leases of certain Messuages, in the Parishes of Saint Martin in the Fields and Saint Clement Danes, in the County of Middlesex, late the Estate of Henry May Esquire, deceased;" and to acquaint this House, that they have agreed to the said Bill, without any Amendment. With a Bill, intituled, "An Act for Sale of Part of the Estate late of Robert Packer Esquire, deceased, in the County of Berks, for discharging Encumbrances thereupon;" to which they desire the Concurrence of this House. Ordered, That an attested Copy thereof be, and is hereby, referred to Mr. Justice Denton and Mr. Justice Comyns; who are forthwith to summon all Parties concerned in the Bill; and, after hearing them, and perusing the said attested Copy of the Bill, are to report to the House the State of the Case, with their Opinion thereupon, under their Hands. The House being moved, "That a Day may be appointed, for hearing the Cause wherein Andrew Scot and others are Appellants, and the Magistrates and Town Council of Glasgow Respondents:"
Hodie 2a vice lecta est Billa, intituled, "An Act for enlarging the Time granted by an Act passed in the Third Year of the Reign of His late Majesty King George, intituled, An Act for enlarging the Time granted by an Act passed in the Eighth Year of the Reign of Her late Majesty Queen Anne, intituled, An Act for making a convenient Dock, or Bason, at Liverpool, for the Security of all Ships trading to and from the said Port of Liverpool; and for enlarging the same, by making an additional Dock, and building a Pier in the open Harbour there; and for enlightening the said Dock." The Earl of Warwick reported from the Lords Committees to whom the Bill, intituled, "An Act to naturalize Herman Bernard and John Bosquain," was committed: "That they had considered the said Bill, and examined the Allegations thereof, which they found to be true; and that the Committee had gone through the Bill, and directed him to report the same to the House, without any Amendment." Nairne to sue, notwithstanding his Attainder, Bill. With a Bill, intituled, "An Act to enable John Nairne to sue, or maintain any Action or Suit, notwithstanding his Attainder; and to remove any Disability in him, by reason of his said Attainder, to take or inherit any Real or Personal Estate that may or shall hereafter descend or come to him;" to which they desire the Concurrence of this House. Hodie 3a vice lecta est Billa, intituled, "An Act to enable Thomas May Esquire and his Sons, and the Heirs Male of their Bodies, to take and use the Surname of Knight, pursuant to the Will of Elizabeth Knight, deceased." Hodie 3a vice lecta est Billa, intituled, "An Act for continuing of an Act, made in the Sixth Year of the Reign of His present Majesty, intituled, An Act for the better Regulation of Lastage and Ballastage in the River Thames." Hodie 3a vice lecta est Billa, intituled, "An Act for allowing further Time for Enrolment of Deeds and Wills made by Papists; and for Relief of Protestant Purchasers, Devisees, and Lessees." Hodie 3a vice lecta est Billa, intituled, "An Act for continuing the Terms and Powers granted and given by the Acts passed in the Twelfth and Thirteenth Year of the Reign of His late Majesty King William, and the Tenth Year of Her late Majesty Queen Anne, for recovering, securing, and keeping in Repair, the Harbour of Minehead, in the County of Somerset." Hodie 3a vice lecta est Billa, intituled, "An Act for the Relief of such Prisoners for Debt as have, by unavoidable Accidents, lost the Benefit of an Act passed in the last Session of Parliament, intituled, "An Act for Relief of Insolvent Debtors;" and for the Indemnity of such Sheriffs and Gaolers as have incurred any Penalties on account of such Prisoners not being discharged; and for extending the Benefit of the said Act to Creditors, whose Debtors were committed to Prison since the First Day of January One Thousand Seven Hundred and Thirty, and were detained there upon the First Day of January One Thousand Seven Hundred and Thirty-six, and have chose to continue there." Hodie 3a vice lecta est Billa, intituled, "An Act for enlarging the Term and Powers granted by Two Acts of Parliament, One of the Third, and the other of the Tenth, Year of the Reign of His late Majesty King George the First, for repairing the Highways from that Part of Counters Bridge which lies in the Parish of Kensington, in the County of Middlesex (leading through the Towns of Brentford and Hounslow), to The Powder Mills, in the Road to Staines, and to Cranford Bridge, in the said County, in the Road to Colnbroke." Hodie 3a vice lecta est Billa, intituled, "An Act to enable William Massingberd Esquire, heretofore called William Meux, and the Heirs Male of his Body, to take and use the Surname of Massingberd, pursuant to a Settlement made by Sir William Massingberd Baronet, deceased." Hodie 3a vice lecta est Billa, intituled, "An Act for enlarging the Term and Powers granted and given by an Act passed in the Twelfth Year of the Reign of His late Majesty King George, for repairing the Road from Lemsford Mill, in the County of Hertford, to Welwyn, and from thence to Cory's Mill, and from Welwyn (through Codicot) to Hitchin, in the said County; and also for repairing the Roads from Cory's Mill to Hitchin aforesaid." 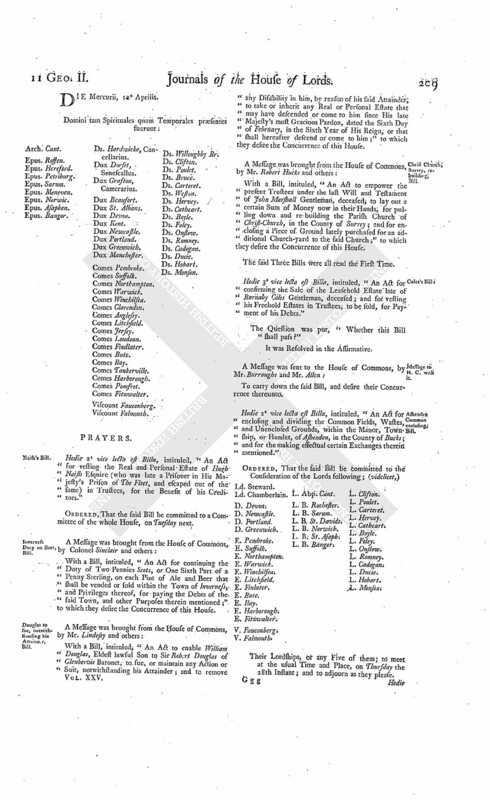 Messages to H. C. that the Lords have agreed to the Seven preceding Bills. D. of Somerset's Privilege, Committee put off. Ordered, That the Sitting of the Committee of Privileges, on the Matter of the Complaint of a Breach of Privilege against the Duke of Somerset, by William Allanson Esquire, be put off from To-morrow, to that Day Sevennight. The House being moved, "That a Day may be appointed, for arguing the Errors assigned upon a Writ of Error brought into this House, wherein Samuel Berington, on the Demise of John Dormer Esquire, is Plaintiff, and John Parkhurst Esquire and others are Defendants:"
It is Ordered, That this House will hear the said Errors argued, by Counsel, at the Bar, on the First vacant Day for Causes after those already appointed. Hodie 2a vice lecta est Billa, intituled, "An Act for the better regulating the Manufacture of Narrow Woollen Cloths, in the West Riding of the County of York." Address, for Letters, &c. on Spanish Affairs. Ordered, That an humble Address be presented to His Majesty, "That He will be graciously pleased to give Directions, that there be laid before this House, Copies of the Duke of Newcastle's Letter to Mr. Keene, dated the 4th of November 1737, and of the Draught of a Memorial therein enclosed, to be presented to the King of Spain; and of any other Memorials presented to His Catholic Majesty, or Letters wrote by Mr. Keene to any of His Catholic Majesty's Ministers in Consequence thereof; and also Copies of Monsr. La Quadra's Letter to Mr. Keene, dated the 10th of February 1738; and of the Duke of Newcastle's Letter, dated the 17th of March 1737/8, and of the Draught of a Letter therein enclosed, to be written by Mr. Keen to Monsr. La Quadra." Murray against Cathcart & al. It is Ordered, That the further Hearing of the said Cause be adjourned till To-morrow; and that the Hearing of One Counsel for each Party, in relation to the Matter of the Petitions of the Respondents to Sir Hew Dalrymple's Appeal, presented to this House on Tuesday last, which is appointed for To-morrow, be put off to the next Day; and the Cause for that Day be put off to Friday next; and the other Causes removed in Course. Dominus Cancellarius declaravit præsens Parliamentum continuandum esse usque ad et in diem Martis, decimum octavum diem instantis Aprilis, hora undecima Auroræ, Dominis sic decernentibus. Hodie 2a vice lecta est Billa, intituled, "An Act for the effectual Draining and Preservation of certain Fens, called Cawdle Fenn, Waterden, and Redmoor, and One Piece of Fen Ground, called The Holts, in the Isle of Ely, in the County of Cambridge." L. Bp. St. Asaph. L. Clinton. The Earl of Warwick reported from the Lords Committees to whom the Bill, intituled, "An Act to enlarge the Term and Powers granted by an Act of Parliament, made and passed in the Third Year of the Reign of His late Majesty King George, intituled, An Act to enable the Parishioners of the Parish of Saint Mary, Rotherith, in the County of Surrey, by certain Funeral Rates therein mentioned, to finish the said Parish Church; and to enable the said Parishioners to raise such further Sums of Money as shall be necessary for purchasing a convenient Piece of Ground for an additional Burial Ground, and for other Purposes therein mentioned," was committed: "That they had considered the said Bill, and examined the Allegations thereof, which they found to be true; and that the Committee had gone through the Bill, and directed him to report the same to the House, without any Amendment." Hodie 1a vice lecta est Billa, intituled, "An Act for vesting certain Mills, Lands, and Hereditaments, in the Parishes of Ware and Great Amwell, in the County of Hertford (being Part of the Estate of Thomas Plummer Byde an Infant, and comprized in his Grandfather's Marriage Settlement) in the Governor and Company of The New River brought from Chadwell and Amwell to London, and their Successors; and for securing a perpetual Rent Charge in Lieu thereof, for the Benefit of the Persons claiming under the said Settlement." Upon reading the Petition and Appeal of Robert Edgworth Gentleman, a Minor, by his Guardian Robert Roberts Esquire; complaining of several Orders of the Court of Exchequer in Ireland, of the 13th of December, and 27th and 28th of February last, made in a Cause wherein Packington Edgworth Esquire was Plaintiff, and Edward Edgworth Esquire and the Appellant and others were Defendants; and praying, "That the said Orders may be reversed, and Packington Edgworth's Bill dismissed with Costs; and that the House will be pleased to make such Order, for the Preservation of the Appellant's Remainders in the Appeal mentioned, as to their Lordships in their great Wisdom shall seem just:"
It is Ordered, That the said Edward Edgworth and Packington Edgworth may have a Copy of the said Appeal; and they are hereby required to put in their Answer or respective Answers thereunto, in Writing, on or before Tuesday the 23d Day of May next; and that Service of this Order on their respective Attornies or Clerks in the said Court of Exchequer in Ireland be deemed good Service. Marq. Annandale, peremptorily to answer E. Hoptoun's Appeal. The House was informed, "That George Marquis of Annandale had not put in his Answer to the Cross Appeal of Charles Earl of Hoptoun and his Countess, though due Service had been made of the Order of this House for that Purpose." Ordered, That the said Marquis do put in his Answer peremptorily to the said Appeal, in a Week. The Earl of Findlater reported from the Lords Committees to whom the Bill, intituled, "An Act for continuing the Duty of Two Pennies Scots, or One Sixth Part of a Penny Sterling, on each Pint of Ale and Beer, that shall be vended or sold within the Town of Inverness, and Privileges thereof, for paying the Debts of the said Town, and other Purposes therein mentioned," was committed: "That the Committee had considered the said Bill, and examined the Allegations thereof, which they found to be true; and that they had gone through the Bill, and directed him to report the same to the House, without any Amendment." Hodie 3a vice lecta est Billa, intituled, "An Act for naturalizing Herman Bernard and John Bosquain." 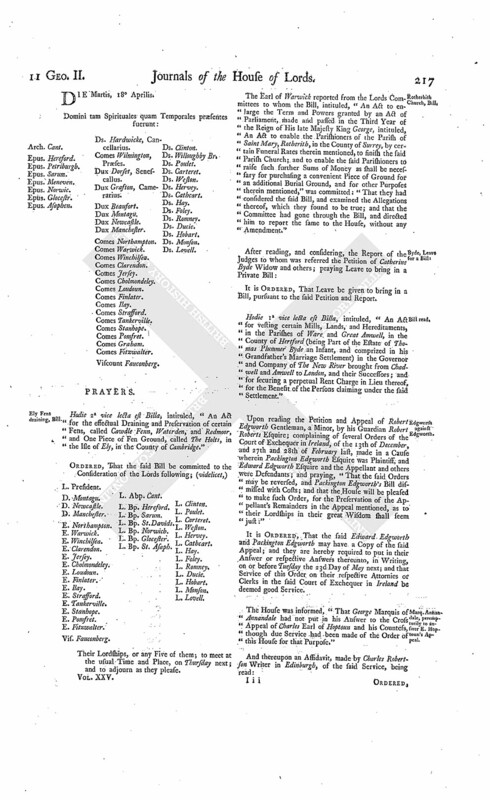 The Order of the Day being read, for the House to be put into a Committee upon the Bill, intituled, "An Act for vesting the Real and Personal Estate of Hugh Naish Esquire (who was late a Prisoner in His Majesty's Prison of The Fleet, and escaped out of the same), in Trustees, for the Benefit of his Creditors:"
Ordered, That the House be put into a Committee thereupon To-morrow. Nairne to sue, notwithstanding his Attainder, Bill: His Majesty's Consent to it. The Duke of Newcastle acquainted the House, "That His Majesty, having been apprized of the Contents of the Bill, intituled, "An Act to enable John Nairn to sue, or maintain any Action or Suit, notwithstanding his Attainder; and to remove any Disability in him, by reason of his said Attainder, to take or inherit any Real or Personal Estate that may or shall hereafter descend or come to him," was pleased to consent thereunto, so far as the Interest of the Crown is concerned." Their Lordships, or any Five of them; to meet at the usual Time and Place To-morrow; and to adjourn as they please. Murray against Colonel Cathcart & al. Dominus Cancellarius declaravit præsens Parliamentum continuandum esse usque ad et in diem Mercurii, decimum nonum diem instantis Aprilis, hora undecima Auroræ, Dominis sic decernentibus. Ordered, That the Committee to whom the Bill, intituled, "An Act for enclosing and dividing the Common Fields and Common Grounds, in the Manor and Parish of Binbrook, in the County of Lincoln," stands committed, be revived; and meet To-morrow. With a Bill, intituled, "An Act for granting an Aid to His Majesty, by a Land Tax, to be raised in Great Britain, for the Service of the Year One Thousand Seven Hundred and Thirty-eight;" to which they desire the Concurrence of this House. With a Bill, intituled, "An Act for building a Bridge cross the River Thames, from The Wool-staple or thereabouts, in the Parish of St. Margaret, in the City of Westminster, to the opposite Shore, in the County of Surrey;" to which they desire the Concurrence of this House. 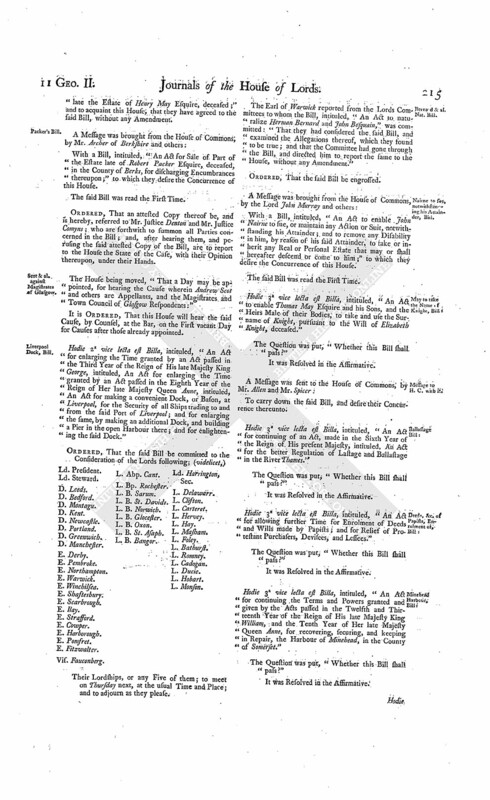 With a Bill, intituled, "An Act for repairing the Roads from the Town of Loughborough, in the County of Leicester, to the Town of Derby, in the County of Derby; and from the said Town of Derby to the Town of Brassington, in the said County of Derby; and from the said Town of Derby, through the Town of Asheborne, in the said County of Derby, to Hurdloe House, in the Parish of Hartington, in the said County;" to which they desire the Concurrence of this House. 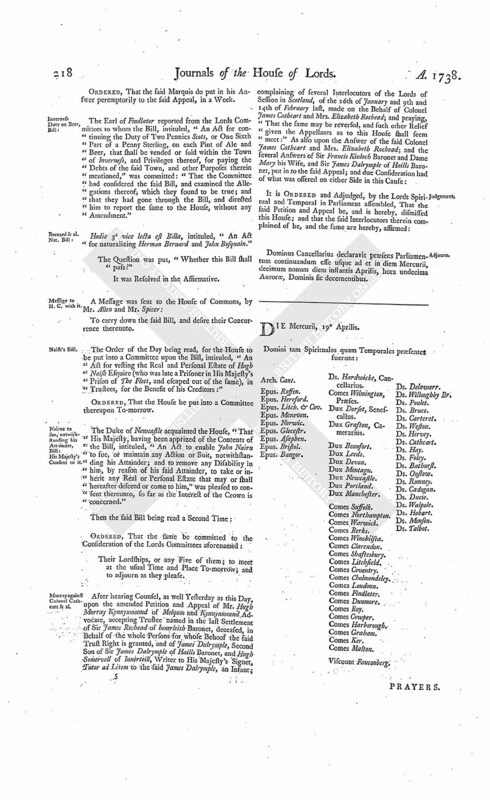 With a Bill, intituled, "An Act to indemnify Persons who have omitted to qualify themselves for Offices, or to read the Prayers, and make the Declarations and Subscriptions required, within the respective Times limited by Law; and for allowing further Time for those Purposes;" to which they desire the Concurrence of this House. 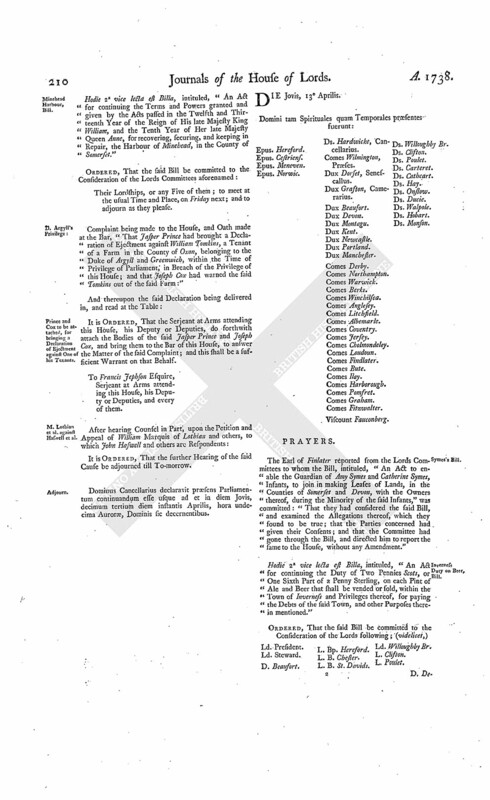 The Earl of Cholmondeley reported from the Lords Committees to whom the Bill, intituled, "An Act for explaining and amending a certain Trust and Power, contained in the Settlement made on the Marriage of Richard Lord Viscount Molyneux of the Kingdom of Ireland, with Mary Lady Molyneux his now Wife, for raising Portions for the Daughters of the said Marriage, and for the better ascertaining and more effectually securing the said Portions," was committed: "That they had considered the said Bill, and examined the Allegations thereof, which they found to be true; that the Parties concerned had given their Consents; and that the Committee had gone through the Bill, and made some Amendments thereunto." Inverness, Duty on Beer, Bill. Hodie 3a vice lecta est Billa, intituled, "An Act for continuing the Duty of Two Pennies Scots, or One Sixth Part of a Penny Sterling, on each Pint of Ale and Beer that shall be vended or sold, within the Town of Inverness and Privileges thereof, for paying the Debts of the said Town, and other Purposes therein mentioned." The Lord Onslow reported from the Lords Committees to whom the Bill, intituled, "An Act to empower the present Trustees under the last Will and Testament of John Marshall Gentleman, deceased, to lay out a certain Sum of Money now in their Hands, for pulling down and re-building the Parish Church of Christ Church, in the County of Surrey; and for enclosing a Piece of Ground, lately purchased, for an additional Church-yard to the said Church," was committed: "That they had considered the said Bill, and examined the Allegations thereof, which they found to be true; and that the Committee had gone through the Bill, and directed him to report the same to the House, without any Amendment." Petitions concerning Sir Henry Dalrymple's Appeal considered and Appeal dismissed. Counsel were called in, and heard accordingly, as well for the Appellant, as for the Petitioners the Respondents. 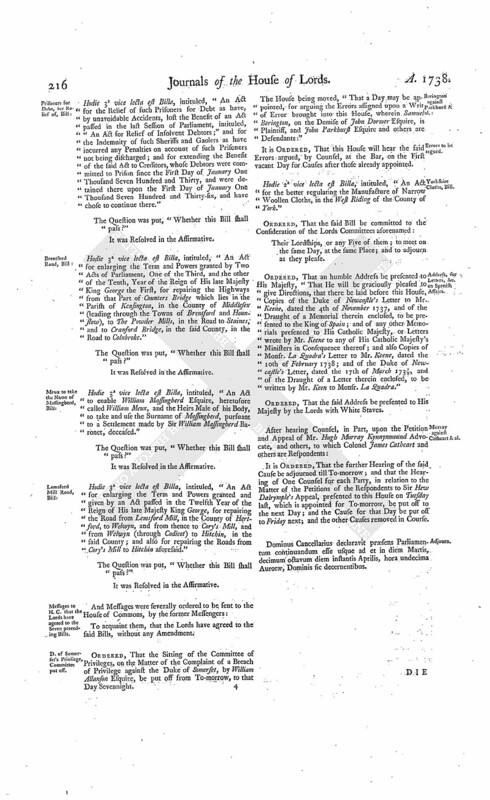 It is Declared, by the Lords Spiritual and Temporal in Parliament assembled, That the said Appeal was brought too early, by reason of the Pendency of the Reclaiming Bill of the said Mary Buchan in the Court of Session in Scotland: And it is therefore hereby Ordered, That the said Appeal be dismissed; and that the said Court of Session do proceed to a final Determination of the Cause, according to Law and Justice; and that, after such Determination made, any of the Parties be at Liberty to appeal, as they shall be advised: And, to the End that any of the said Parties may have an Opportunity of appealing, without being prejudiced by the Dismission of the present Petition of Appeal, it is also Ordered, That, in case such Determination shall be made by the said Court of Session whilst the Parliament shall not be sitting, the Possession of the Estate in Question shall not be changed till after the End of Fourteen Days from the Beginning of the then next Session of Parliament; but in case such Determination shall be made whilst the Parliament shall be litting, then such Possession shall not be changed till after the End of Twenty Days from the Time of such Determination: And it is further Ordered, That the said Appellant do pay, or cause to be paid, to the Respondent the said Mary Buchan, the Sum of Thirty Pounds, for her Costs in respect of the said Appeal. The House (according to Order) was adjourned during Pleasure, and put into a Committee upon the Bill, intituled, "An Act for vesting the Real and Personal Estate of Hugh Naish Esquire (who was late a Prisoner in His Majesty's Prison of The Fleet, and escaped out of the same) in Trustees, for the Benefit of his Creditors." And the Earl of Cholmondeley reported from the said Committee, "That they had gone through the Bill, and made some Amendments thereunto; which he was directed to report, when the House will please to receive the same." Hodie 2a vice lecta est Billa, intituled, "An Act for vesting certain Mills, Lands, and Hereditaments, in the Parishes of Ware and Great Amwell, in the County of Hertford (being Part of the Estate of Thomas Plummer Byde Esquire, an Infant, and comprized in his Grandfather's Marriage Settlement) in the Governor and Company of The New River brought from Chadwell and Amwell to London, and their Successors; and for securing a perpetual Rent-charge in Lieu thereof, for the Benefit of the Persons claiming under the said Settlement." L. Bp. Bangor. L. Delawarr. Their Lordships, or any Five of them; to meet at the usual Time and Place, on Wednesday the 3d Day of May next; and to adjourn as they please. The Earl of Findlater reported from the Lords Committees to whom the Bill, intituled, "An Act to enable William Douglas, Eldest lawful Son to Sir Robert Douglas of Glenbervie Baronet, to sue or maintain any Action or Suit, notwithstanding his Attainder; and to remove any Disability in him, by reason of his said Attainder, to take or inherit any Real or Personal Estate that may have descended or come to him since His late Majesty's most Gracious Pardon, dated the Sixth Day of February, in the Sixth Year of His Reign, or that shall hereafter descend or come to him," was committed: "That they had considered the said Bill, and examined the Allegations thereof, which were found to be true; and that the Committee had gone through the Bill, and directed him to report the same to the House, without any Amendment." His Lordship made the like Report from the Committee to whom the Bill, intituled, "An Act to enable John Nairne to sue, or maintain any Action or Suit, notwithstanding his Attainder; and to remove any Disability in him, by reason of his said Attainder, to take or inherit any Real or Personal Estate that may or shall hereafter descend or come to him," was committed. The Lord Chamberlain acquainted the House, "That the Lords with White Staves had (according to Order) presented to His Majesty their Lordships Address of Monday last, for Copies of Letters and Memorials relating to the Spanish Depredations; and that His Majesty had been pleased to give Order, that the Copies desired should be laid before the House." Dominus Cancellarius declaravit præsens Parliamentum continuandum esse usque ad et in diem Jovis, vicesimum diem instantis Aprilis, hora undecima Auroræ, Dominis sic decernentibus. The Earl of Cholmondeley reported from the Lords Committees to whom the Bill, intituled, "An Act for enlarging the Time granted by an Act passed in the Third Year of the Reign of His late Majesty King George, intituled, An Act for enlarging the Time granted by an Act passed in the Eighth Year of the Reign of Her late Majesty Queen Anne, intituled, An Act for making a convenient Dock, or Bason, at Liverpool, for the Security of all Ships trading to and from the said Port of Liverpool; and for enlarging the same, by making an additional Dock, and building a Pier in the open Harbour there, and for enlightening the said Dock," was committed: "That they had examined the Allegations of the Bill, which they found to be true; and that the Committee had gone through the Bill, and directed him to report the same to the House, without any Amendment." The Earl of Warwick made the like Report from the Committee to whom the Bill, intituled, "An Act for the better regulating the Manufacture of Narrow Woollen Cloths, in The West Riding of the County of York," was committed. His Lordship also made the like Report from the Committee to whom the Bill, intituled, "An Act for the effectual Draining and Preservation of certain Fens, called Cawdle Fenn, Waterden, and Redmoor, and One Piece of Fen Ground, called The Holts, in the Isle of Ely, in the County of Cambridge," was committed. Hodie 3a vice lecta est Billa, intituled, "An Act for explaining and amending a certain Trust and Power, contained in the Settlement made on the Marriage of Richard Lord Viscount Molyneux of the Kingdom of Ireland with Mary Lady Molyneux his now Wife, for raising Portions for the Daughters of the said Marriage; and for the better ascertaining and more effectually securing the said Portions." Hodie 2a vice lecta est Billa, intituled, "An Act for repairing the Roads from the Town of Loughborough, in the County of Leicester, to the Town of Derby, in the County of Derby, and from the said Town of Derby to the Town of Brassington, in the said County of Derby, and from the said Town of Derby, through the Town of Asheborne, in the said County of Derby, to Hurdloe-house, in the Parish of Hartington, in the said County." Vis. Fauconberg. L. Bp. Durham. The Earl of Warwick presented to the House (pursuant to their Lordships Order of the 14th of March last) a Bill, intituled, "An Act for the enclosing and dividing the Common Mead, or Moor, called Speen Mead, or Speen Moor, in the County of Berks." Hodie 2a vice lecta est Billa, intituled, "An Act to indemnify Persons who have omitted to qualify themselves for Offices, or to read the Prayers, and make the Declarations and Subscriptions, required within the respective Times limited by Law; and for allowing further Time for those Purposes." Hodie 2a vice lecta est Billa, intituled, "An Act for granting an Aid to His Majesty, by a Land Tax, to be raised in Great Britain, for the Service of the Year One Thousand Seven Hundred and Thirtyeight." Hodie 2a vice lecta est Billa, intituled, "An Act for building a Bridge cross the River Thomas, from The Woolstaple, or thereabouts, in the Parish of Saint Margaret, in the City of Westminster, to the opposite Shore, in the County of Surrey." 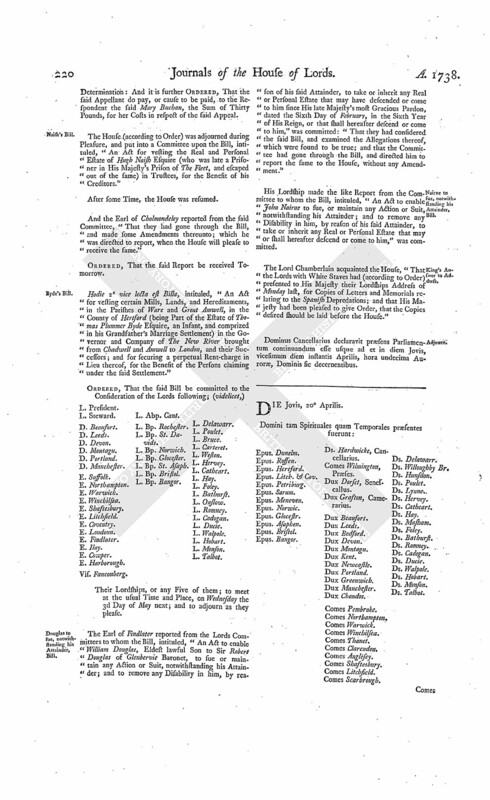 The Order of the Day being read, for receiving the Report of the Amendments made by the Committee of the whole House to the Bill, intituled, "An Act for vesting the Real and Personal Estate of Hugh Naish Esquire (who was late a Prisoner in His Majesty's Prison of The Fleet, and escaped out of the same) in Trustees, for the Benefit of his Creditors:"
Ordered, That the said Bill be re-committed to a Committee of the whole House, on Tuesday next. Hodie 3a vice lecta est Billa, intituled, "An Act to enable John Nairne to sue, or maintain any Action or Suit, notwithstanding his Attainder; and to remove any Disability in him, by reason of his said Attainder, to take or inherit any Real or Personal Estate, that may or shall hereafter descend or come to him." Hodie 3a vice lecta est Billa, intituled, "An Act to enable William Douglas, Eldest lawful Son to Sir Robert Douglas of Glenbervie Baronet, to sue, or maintain any Action or Suit, notwithstanding his Attainder; and to remove any Disability in him, by reason of his said Attainder, to take or inherit any Real or Personal Estate, that may have descended or come to him, since His late Majesty's most Gracious Pardon, dated the Sixth Day of February, in the Sixth Year of His Reign, or that shall hereafter descend or come to him." Hodie 3a vice lecta est Billa, intituled, "An Act to enlarge the Term and Powers granted by an Act of Parliament, made and passed in the Third Year of the Reign of His late Majesty King George, intituled, An Act to enable the Parishioners of the Parish of Saint Mary, Rotherhith, in the County of Surrey, by certain Funeral Rates therein mentioned, to finish the said Parish Church; and to enable the said Parishioners to raise such further Sums of Money as shall be necessary, for purchasing a convenient Piece of Ground for an additional Burial Ground; and for other Purposes therein mentioned." Hodie 3a vice lecta est Billa, intituled, "An Act to empower the present Trustees under the last Will and Testament of John Marshall Gentleman, deceased, to lay out a certain Sum of Money now in their Hands, for pulling down and re-building the Parish Church of Christ Church, in the County of Surrey; and for enclosing a Piece of Ground, lately purchased, for an additional Church-yard to the said Church." To acquaint them, that the Lords have agreed to the Four last mentioned Bills, without any Amendment. Frauds of Tenants to prevent, Bill. The House (according to Order) was adjourned during Pleasure, and put into a Committee upon the Bill, intituled, "An Act for the more effectual securing the Payment of Rents, and preventing Frauds by Tenants." And the Earl of Warwick reported from the said Committee, "That they had made a Progress in the said Bill; and desire another Time may be appointed, for the House to be in a Committee again, to proceed further therein." Ordered, That the House be put into a Committee again, to consider further of the said Bill, on Monday next. Dominus Cancellarius declaravit præsens Parliamentum continuandum esse usque ad et in diem Veneris, vicesimum primum diem instantis Aprilis, hora undecima Auroræ, Dominis sic decernentibus.